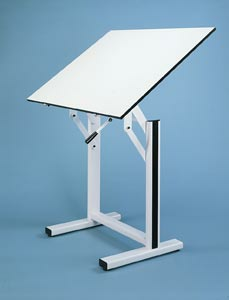 With the base of the Alvin Ensign, you are able to configure a sturdy and durable work surface that provides the stability you need for your drawings. The eggshell finish of this heavy gauge steel base is accentuated by black highlights that makes an attractive addition to your office. If you are looking for an attractive yet well made base for your Ensign drafting table, the double pedestal design of the Alvin Ensign Base Only-Eggshell is the perfect match. The steel construction of this eggshell finish base provides an ample amount of support. The cushioned feet will not mar the surface of your flooring. The rounded profile of this base, as well as the black finish highlights, make this an attractive choice for your work environment. Stability is ensured when you use this base made of heavy duty gauge steel. Make your office complete when you match your base to your drafting table.